The Goverlan Remote Command console is part of the Remote Control tools. It provides a command prompt access to any remote machine. The console can be started as the administrator or as the remote user. Double-click on its icon under a machine object. The console window automatically sets the focus onto the remote machine. The console session is initially started as either the remote user or as yourself, depending on the default configured (See: Defining the Default Starting Authentication below). Click on the Command Prompt icon in the Goverlan Tools area. The console window automatically sets the focus onto the local machine. Once a remote console session is started, the content header always displays the currently focused machine name and the user identification of the session. To change the machine focus to the local machine, use the Connect to local machine links in the Task Panel. Enter the target machine name or IP address. Specify if you wish to start the console session as yourself or as the remote user. If you specify Run as remote User and the target machine is a Terminal Services server or Citrix server, you can click on the user link to select the user session you wish to connect to. Goverlan Remote Console has the ability to enter a PowerShell Command Prompt. 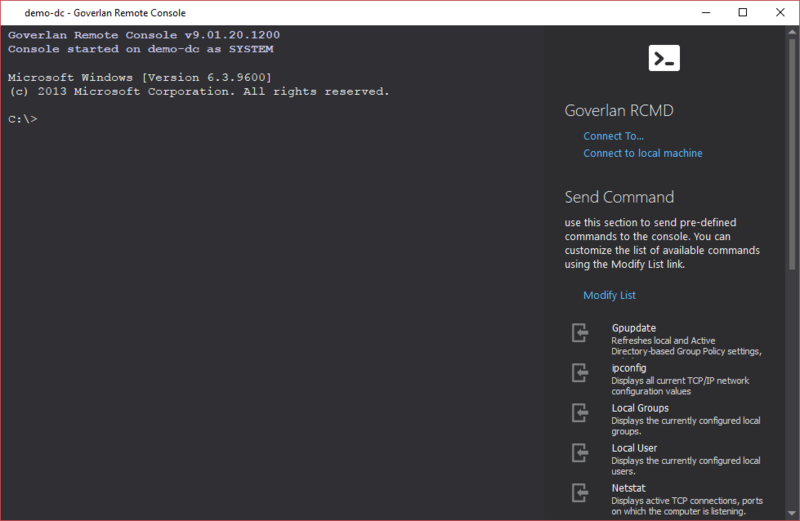 Type the command PowerShell at the Goverlan Remote Console prompt to start the PowerShell command prompt mode. The Goverlan Remote Console will display the PowerShell version. PowerShell cmdlets can be run on this screen remotely without the need to enable Remote WinRM or changing the PowerShell Execution Policy. When opening a Remote Console session on a target machine, the session is initially started as the remote user or as yourself based on the defined default. Click on the Connect To… link in the Task Panel. Click on Run as me or Run as Remote User to define which mode should be the default. Click on the Set as default button. If you open the Remote Console feature via the Users view, the session is automatically focused on the currently focused user. The Remote Console tool has a Send Command section which has been pre-populated with commonly used prompt commands. To send a command to the console, simply click on it. The full command line, including any configured parameters, is then sent and executed to the remote control session. The list of command shortcuts can be configured according to your preference. Click on the Modify List link in the Task Panel to open the Console Commands manager, then add, remove or modify any shortcut.